Federal regulations require hospitals and outpatient facilities to keep a record of the distribution of radiopharmaceuticals. They are required to track dosage amounts and radiation readings. When theses facilities need to dispose of the radiopharmaceutical inventory, they send the containers back to the manufacturer and report this to the FDA. The steps taken can be simplified with nuclear medicine software like ec2 Software Solution’s NMIS program. 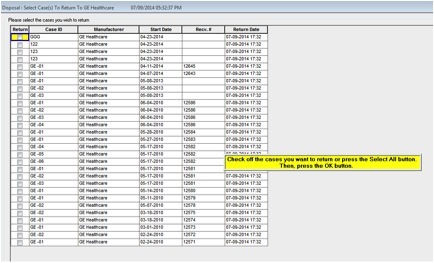 ec2 Software Solution’s has a very exciting and useful e-ordering link between our NMIS hospital software and the RMIS pharmacy software. While e-ordering to purchase products is easy, disposing of them can be equally as easy with our linked software. Hospitals and outpatient facilities can place their orders and disposal from the NMIS scheduling program. The facility selects the type of radiopharmaceutical to be returned. Then, they select the Manufacturer. 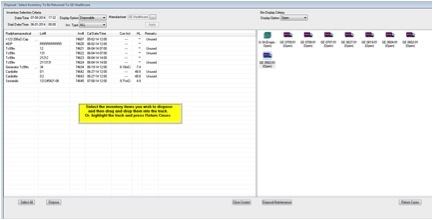 Once the manufacturer is selected, it is easy to drag and drop the inventory into the truck. Press “return cases” and done. The doses are sent back to the Manufacturer, electronically completing the cycle. If you have more than one case to return, you can pinpoint which cases you want to return manually or “Select All”. Using a nuclear medicine software system allows hospitals and facilities to electronic process orders and disposals which eliminates the need for endless paperwork. It can also give facilities a document repository. When an inspector visits a location to evaluate compliance, they can easily select a date range and request the records for that period. They can view all the documentation right on the screen and print any compliance reports needed. If your hospital or outpatient facility has questions about proper radiopharmaceutical disposal and want to learn more about electronic processing, contact ec2 Software Solutions to learn more about their NMIS Software Solution, please visit our website at www.ec2Software.com or at 800-851-0025, option 2.